, laws that shift the composition of the electorate have the impact of shifting resources away from low-turnout communities towards higher turnout communities. That makes these laws all the more worrying as 2016 approaches. A number of earlier studies have already suggested that voter ID laws are motivated by voter suppression. Political scientists Keith Bentele and Erin O'Brien found the laws were, "highly partisan, strategic, and racialized affairs." Later, Bentele and Ian Vandewalker found that, anti-Black stereotyping is "strongly associated" with the proposal of voter ID laws, though share of the population that are Black and turnout among people of color predict the passage of such laws. In an early study, political scientists Daniel Smith and Seth Mckee found that, "where elections are competitive, the furtherance of restrictive voter ID laws is a means of maintaining Republican support while curtailing Democratic electoral gains." In their new study, with political scientist William Hicks, they instead examine what predicts support for voter ID laws among individual legislators. They find, unsurprisingly, that partisan identification is the strongest predictor. However, the also find that, "Democratic lawmakers representing substantial black district populations are more opposed to restrictive voter ID laws, whereas Republican legislators with substantial black district populations are more supportive." This is powerful evidence that voter suppression is at heart of support for voter ID. Another strand of studies examine what leads individuals to support voter ID laws. 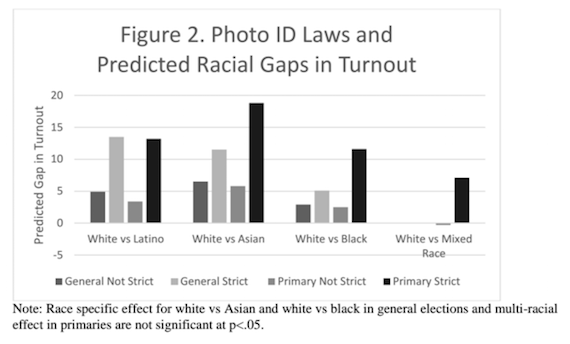 A study by McKee and other scholars finds that, "racial resentment appears to have the strongest impact on attitudes toward strict photo ID laws, and the effect is seen among both Republicans and Democrats." 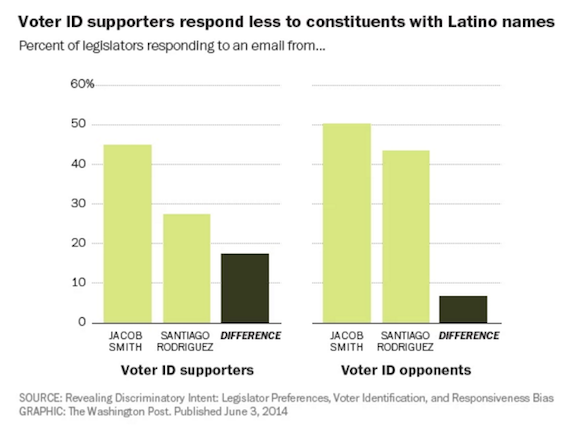 An earlier study by political scientists David Wilson and Paul Brewer finds that racial resentment increases support for voter ID laws (see chart), as does regular Fox News viewership and believes that fraud is widespread. 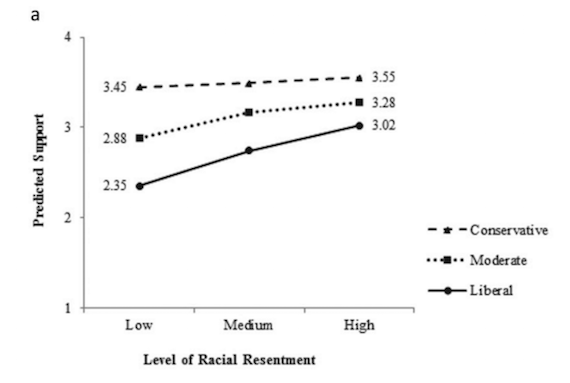 A more recent study by nearly half a dozen scholars finds that, "racial resentment appears to have the strongest impact on attitudes toward strict photo ID laws, and the effect is seen among both Republicans and Democrats." , the impact of these laws is all the more important. to believe that ID laws would skew turnout, because research indicates people of color, young people and low-income people are less likely to have necessary identification. These studies are key in that they make a very persuasive case that voter ID laws are exactly the type of racially-biased shenanigans that the Voting Rights Act was meant to prevent. As I've argued, politicians should actually be pushing for policies that make it easier, not harder to vote. The evidence is strong that AVR would be the most consequential voting rights reform in decades. Recently, I wrote about a 1976 political science dissertation that strengthens the case. It turns out that when registration laws were first being implemented, in many cases the burden of compiling lists fell on town and county officials, rather than on potential voters. It counties where officials compiled lists, turnout was higher than in counties where individuals had to register themselves. This, combined with all of the evidence that registration is a key barrier to political participation and that policies that ease the burden of registration boost turnout, suggests automatic voter registration could dramatically change our nation's political system. Demos recently released a report showing that automatic voter registration could bring at least 27 million new voters into the system (I worked on the numbers). Already in Oregon, the new Automatic Voter Registration system is having a big impact. NPR reports that, "More than 4,000 new voters were registered in the first six days -- compared to an average 2,000 new registrations each month under the old system." In addition, it is becoming increasingly clear that the preclearance provision of the Voting Rights Act, which was re-authorized by overwhelming majorities in Congress is necessary. Ginsburg was indeed correct: the Court threw out the umbrella, and we now face a torrent of voter ID laws.